I used to be a run-of-the-mill typist just like a zillion other girls. My work was drab and so was my salary. My personal life was pretty drab too, because I didn’t have the money to do all the “fun” things that magazines say today’s swinging females should be doing. So when I came across a LaSalle advertisement telling about the exciting career opportunities in Stenotype, I did something about it. Stenotype, you know, is the modern machine shorthand—the world’s fastest. You don’t write it—you type it—in plain English letters, often whole words in one stroke! It’s the shorthand that’s wanted in law offices and government departments, at press conferences and conventions, at the highest executive levels of business—wherever ordinary written shorthand is too slow. I decided that LaSalle’s home study course in Stenotype was what I wanted, so I enrolled. I didn’t have to leave my job while learning and LaSalle even supplied me with the Stenotype machine—for keeps. I didn’t know a thing about shorthand when I started. Yet when I completed the course, I was doing 150 words a minute, without any strain at all. My first Stenotype assignment paid me surprisingly well. Pretty soon my speed built up and so did the demand for my services. I was taking minutes at board meetings and executive conferences—surrounded by men who run the show. Whenever shorthand speed is needed, I’m usually called. The pay is beautiful. And I think I’ve met more people in a year that I ever expected to meet in a lifetime. The above story is intended to illustrate the attractions of a career as a Stenotypist. 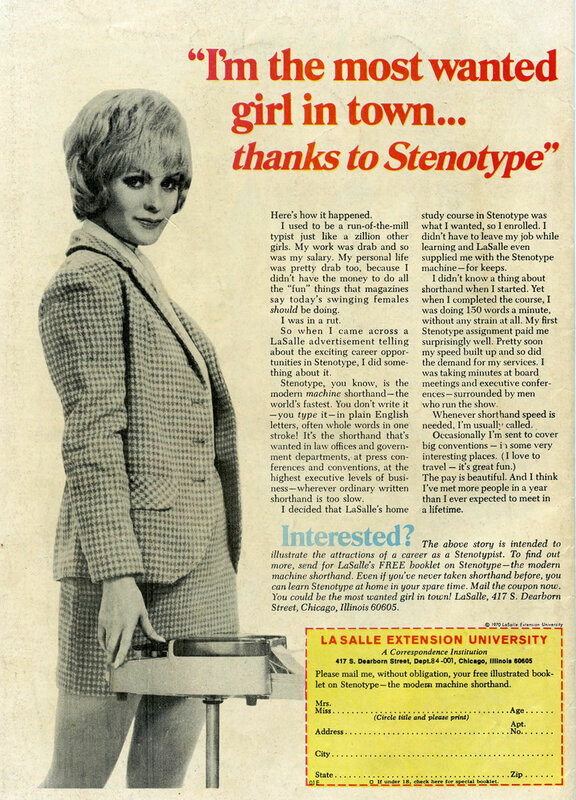 To find out more, send for LaSalle’s FREE booklet on Stenotype—the modern machine shorthand. Even if you’ve never taken shorthand before, you can learn Stenotype at home in your spare time. Mail the coupon now. You could be the most wanted girl in town! LaSalle, 417 S. Dearborn Street, Chicago, Illinois 60605. Please mail me, without obligation, your free illustrated booklet on Stenotype—the modern machine shorthand. [ ] If under 18, check here for special booklet.